Mabon or the Autumn Equinox is usually celebrated around September 21st, though it can occur as early as the 20th or as late as the 23rd, depending on the timing of the actual Astrological event. 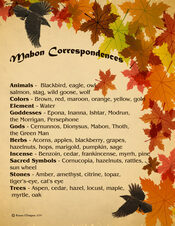 Mabon occurs on the date which the sun enters the sign of Libra, the scales. Night and Day are equally balanced at Autumn Equinox but soon the scales will tip, and waning of the Sun will bring longer nights and shorter days. The days will continue to grow shorter until the Wheel of the Year spins around again to Yule. In the Wheel of the Year, the God begins His journey to the Underworld and the Goddess grows older, She misses the God and follows him, as She withdraws Her power, the land begins to turn cold and wither. The Tide of Life is waning, the Tide of Death is growing. 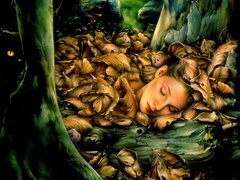 Mabon brings forth a flood of decomposition that reaches fullness at Samhain. The symbolism of this Sabbat is that of the Second Harvest, the Mysteries, Equality and Balance - when day and night are equal. It is harvest season and we celebrate with feasts and thanksgiving. 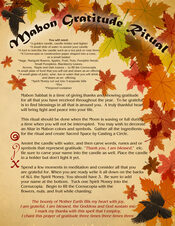 The Sabbat of Mabon is named for the Child of Light and the son of the Great Mother, Modron. Mabon the son of Modron was stolen from his mother only three nights after his birth at the beginning of time. The Great Mother grieved for her son and the world became dark and cold. The plants withered and died and, the animals, fat from the summer fruits, slept in their caves safe from the coming winter. 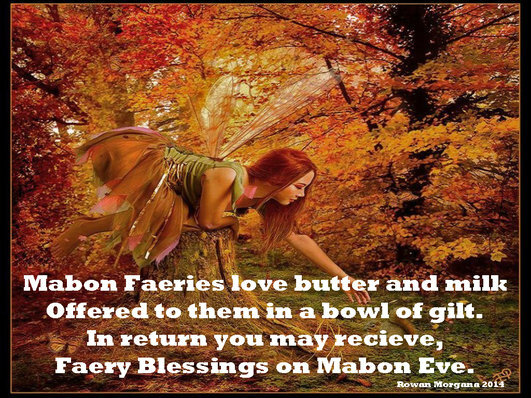 Mabon is eventually found with the help of the wisdom and memory of the Oldest Animals – the Blackbird, the Stag, the Owl, the Eagle and the Salmon. The battle to release the Child of Light is not an easy one and will take months to complete. Ever since Mabon was stolen, the seasons of cold and darkness prevail paralleling the grief of Mother Earth for the loss of Her child. Because Modron's child is imprisoned deep within the earth, the plants and animals of earth slow down and move inward. 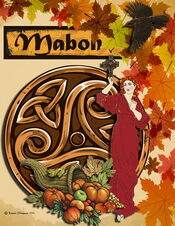 Though Mabon is eventually found, he will not be released until Yule, when the days again begin to grow longer. 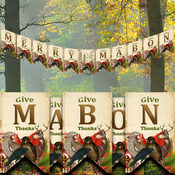 At Yule, Mabon is reborn as the Child of Promise, the Son of Light. Make solar disks for the birds by hanging sunflowers in the trees. Bless them with a prayer. Gather food and place in a basket to give to a local food bank. Make a Sun Wheel using paper plates and gold glitter. Wire two sticks together to form an equal-armed cross and decorate with leaves etc. Fill a cornucopia with apples, nuts, grapes etc. and place it in the centre of your altar. Harvest what is ready in your garden and tend what is not yet ready. Give thanks to your plants for their bounty. Create a small outdoor altar as a sacred space to honour the spirits of your land. Leave offerings of your garden's bounty. Make offerings to animals by scattering seeds and grains in special shapes such as solar disks or yin-yang symbols. Make offerings to woodland creatures by leaving some of your garden fruits, nuts and vegetables in the forest. Collect seeds from your garden for next year's crops. If you have grapevines, leave an offering of wine to Bacchus. Go for a walk outdoors and gather brightly coloured leaves. Plant herbs, bulbs, vines and new trees. Gather with your friends and have a potluck feast. String a necklace of hazelnuts and place on your altar to gain protection over the coming dark months. Sacred Hazelnut - The Celts believed that hazelnuts gave one wisdom and inspiration. Legend tells us that if we follow the Boyne River in Ireland to it's source we will come to a sacred pool surrounded by nine ancient hazel trees. Living within the pool is a salmon, the most ancient of all the animals. As the hazelnuts drop into the pool, the salmon eats them, absorbing their wisdom. The Salmon of Wisdom is instrumental in revealing to us the mystery of decent and re-birth. At Mabon the Child of Light is trapped deep within the earth and The Salmon is the only animal that knows where he is hidden. The Salmon directs us to the Child of Light, but we cannot free Him until Yule. The Salmon helps us to navigate the dark rivers of the enclosing darkness of Mabon to the increasing light of Yule. The Cornucopia or Horn of Plenty is a wonderful focal point for your Mabon Altar. The word "cornucopia" is derived from two Latin words, “cornu,” meaning "horn" and “copia,” meaning "plenty." The Cornucopia is a sacred symbol associated with a variety of Pagan deities. In the Roman religion, this included Fortuna, the Goddess of Luck and Fortune; Plutus, God of Wealth; Concordia, Goddess of Peace and Harmony; and Flora, Goddess of Flowers. The Romano-British and Celtic Horse Goddess Epona sometimes was depicted in the form of the Great Mother carrying a Cornucopia. Nantosuelta, Goddess of the Winding Stream, appeared with a Cornucopia on some ancient monuments, as was the case with Persephone, Greek Goddess of the Underworld. The Cornucopia symbol has been in evidence for over 2000 years, and is a symbol of Autumn and harvest, of giving thanks for the abundance of the Earth Mother. Fill a Cornucopia with assorted veggies, fruit, herbs, nuts and other produce, giving thanks for each item as added. Once your Cornucopia is full, leave it outside in a natural place, the next day return to the Earth whatever hasn't been eaten by wild creatures and Nature Sprits. Place a Cornucopia on your personal altar as part of prosperity rituals. Fill it with dried sprigs of sage, cinquefoil, rosemary, thyme, mugwort, parsley, and/or other sacred plants, such as acorns, associated with well-being, prosperity, and good fortune. Dedicate the Cornucopia as a tool of abundance, and then place deep with it a written wish for a particular type of abundance. Envision the wish coming true. After the ritual has ended, keep the Cornucopia in a protected, yet visible place so that you see it every day. Follow-up by taking actions that can help your wish come true. After you have achieved your goal, give thanks by offering the contents to a sacred fire or by burying them in the ground. You can use a Cornucopia to bless your home or the home of a loved one. Fill a Cornucopia with herbs, flowers, fruit, vegetables, crystals, and other items associated with well-being and a happy home. After spiritually cleansing the home with incense and other tools, carry the filled Cornucopia clockwise around each room of the house as you focus on well-wishes. Then, place the Cornucopia in the main room of the home for at least a day and a night. After they have lost their freshness, bio-degradable ingredients can be removed and returned to Nature. The Cornucopia later can be used in other sacred ways in the home, such as a Sign of the Season or for Prosperity Magic. Mix all together with your mortar and pestle. In an electric mixer or large mixing bowl, beat the egg whites until stiff. In a different bowl, beat the egg yolks until thick and lemon-colored. Combine the yolks with the remaining eight ingredients; mix together well; and then fold in the egg whites. In a saucepan, soak the oats in the warm water for 15 to 20 minutes, until soft and slightly swollen. Drain off the excess water. Transfer to a large mixing bowl. Add the potatoes, butter, cornstarch, baking powder and spices, mixing well. Knead until the mixture is like thick dough. Form eight round patties. Pour 1/2 inch of oil into a skillet. Fry the patties until lightly browned. Serve immediately. Peel, core and quarter the pears. In a saucepan, mix the red wine, pineapple juice, brown sugar, and juniper berries. Let the mixture simmer for 3 minutes. Add the pears. Simmer, uncovered, for 15 minutes. Stir and baste occasionally. Serve in small decorative bowls or red wine glasses. Filled with love from Goddess Divine. Cauldron bubbles with my desire. The ballad relates the tale of the Corn King, or Corn-God. According to James George Frazier's The Golden Bough, the Corn King was selected from the men of the tribe, treated as a king for a year, then at a pre-set time, danced the corn maze and was killed. His body was then dragged through the fields so the blood would run in the furrows and make the barley grow. Afterward, he himself may have been eaten.